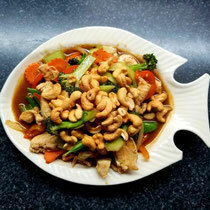 Chicken and house roasted cashews sautéed with onions, broccoli, snap peas, carrots, celery and peppers. 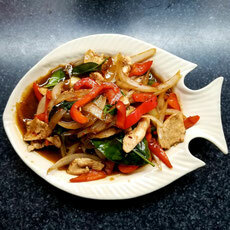 Tender chicken, Thai basil and chilies sautéed with onions and peppers. 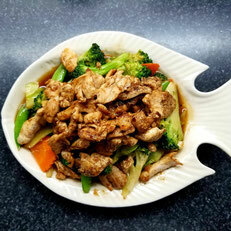 Gingered chicken sautéed with black mushrooms, onion, peppers, celery and broccoli. 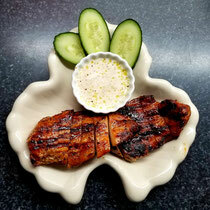 Slow roasted barbecue chicken crusted with a blend of Thai spices. Served with house barbecue sauce. 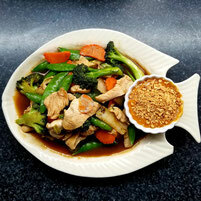 Sliced chicken sautéed with fresh vegetables, served with a side of house peanut sauce. 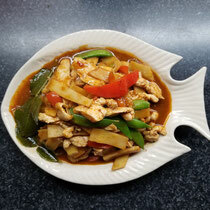 Sliced chicken sautéed with bamboo shoots, peppers, snap peas, Thai basil and kaffir lime leaves, spiced with Thai red curry. 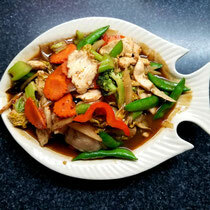 Sliced chicken sautéed with garlic sauce on a bed of broccoli, snap peas and carrots.